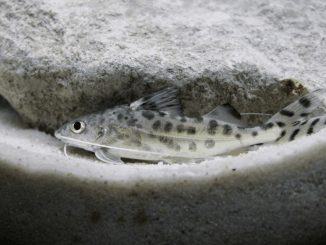 HomeAquariumWhat Makes The Perfect Cichlid Tank? Cichlids are by far one of the most popular freshwater aquarium fish around. They are known for their unique personalities and vibrant colors. 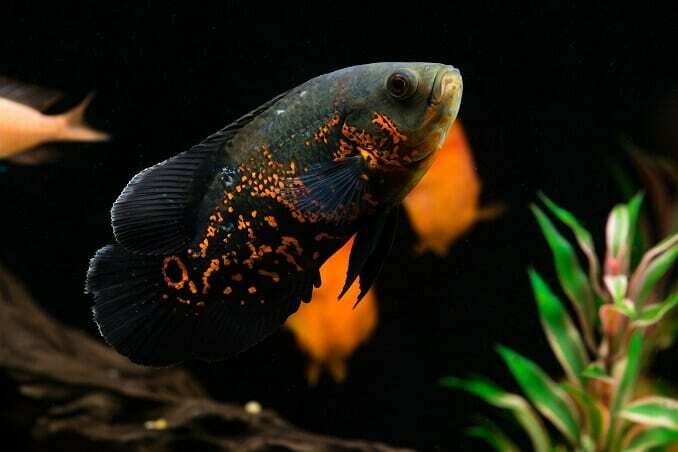 Some of the most popular species of Cichlids include: Oscars, Angelfish, Discus and Convicts. Unfortunately Cichlids sometimes get a bad reputation for being difficult to keep, with people citing behavioral problems as one of the main reasons. Lots of these problems can be avoided if the Cichlid is placed in a suitable aquarium. So in this article we are going to discuss what makes the perfect cichlid tank. We will start with giving an overview of Cichlids and their basic care requirements, before going into detail about their tank requirements and needs. Your Free Giveaway: Get your free Cichlid Tank Guide on how to set up the perfect species tank for Cichlids. This acrylic aquarium is not only 17 times stronger than glass but also half the weight. This would make a great home for the average sized cichlid. Without a doubt Cichlids are by far one of the most popular types of freshwater fish. 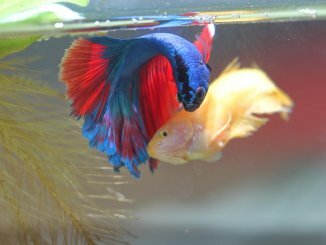 They are renowned for their stunning visual appearance, unique behaviors and fun personalities. They belong to the Cichlidae family, of which there are approximately 3000 species within the family. Cichlids body types range from the tiny Neolamprologus multifasciatus, which are less than an inch long, to the Giant cichlid, which can grow to over 3 foot in length. Similarly their body shapes also vary hugely from cylindrical and elongated to a more horizontally flat appearance. In general though, people will think of them as medium sized, oval shaped fish with a vibrant, colorful appearance. 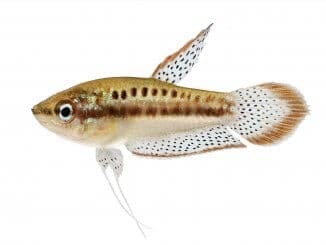 They are definitely some of the most advanced and intelligent freshwater aquarium species, however the Cichlidae family often gets a bad reputation for being territorial and because of this it isn’t well regarded as a peaceful community fish. Whilst this is true, this behavior is often exacerbated because the aquarium hasn’t been properly setup to house Cichlids. Once you learn what makes the perfect cichlid tank, you will be rewarded with a stunning fish that is extremely interesting to observe with a wealth of complex behaviors. It should be noted before we go any further that the Cichlidae family is home to some 3000 species, so there is no one size fits all approach for Cichlids. With that said though there some commonalities and some basic guidelines that can be established across all Cichlids. Firstly, they are some of the hardiest aquarium fish around, with the average Cichlid being between 4 to 12 inches in length. As the majority of them come from slow running freshwater rivers, you should make sure that the water flow in their aquarium is slow. The males are territorial and if keeping multiple Cichlids together you should use plants and natural breaks to split up the aquarium to prevent fighting. Now whilst we’re talking about the aquarium, it’s best to choose one with a large bottom surface area (high width and breadth). The tank should also be placed in a quiet location as they are easily spooked, so choose a low footfall area. 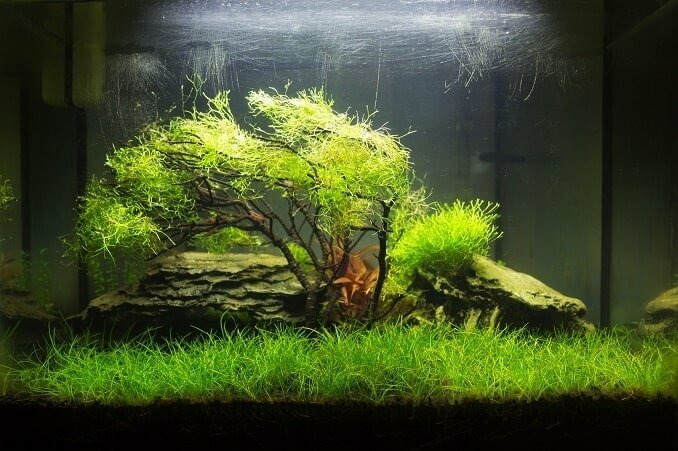 As for decoration, let it be known that they constantly dig and uproot plants, so if you want to decorate your tank, make sure to use hardy plants such as java moss. You can’t say much more about the perfect Cichlid aquarium without going into specific breed examples. So to give you some more-detailed examples, we’ve chosen the 4 most popular varieties of Cichlids (Oscars, Angelfish, Discus and Convicts) and explained how to setup the perfect tank for them. Before we discuss their tank setup, I think it’s important to know the natural habitat of an Oscar fish. This way you can bear it in mind when planning your aquarium setup. Oscars are native to South America and are found in the Amazon River basin. Its natural environment is renowned for its slow moving water and sandy substrate. They have been known to grow up to 18inches, so they need a fairly large tank. Ideally a 75-gallon tank and a further 50 gallons for each additional Oscar added. The aquarium should have good filtration as they are known for being messy fish. If you wish to decorate the tank you can, but make sure the decorations are anchored down as Oscars will attempt to rearrange their tanks. When it comes to plants, I’d recommend artificial ones as Oscars have an unfortunate knack of tearing apart real plants. As for lighting, Oscars do not require specialized lighting. However you will probably want to light the aquarium, as they are generally dull colors so can be difficult to see clearly without lighting. Finally for substrate you can use gravel or sand, however our preference is sand. Once the tank has been setup you now need to maintain the conditions. You should keep the temperature between 77° and 80°F, and maintain a pH level of 6 to 7.5. Oscars are jumpers so you need to make sure the lid on your tank is secure. Oscars can bump the lid on a regular sized tank, so make sure to fix it down. Finally, as you will be aware, Oscars are messy fish, so weekly water changes are mandatory; 10-15% will be sufficient. 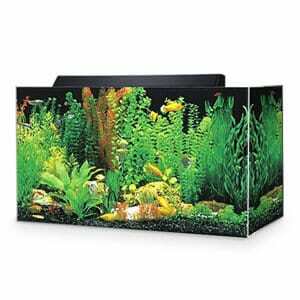 This aquarium comes as a complete kit, with the tank a fish net, a 200W heater, a filter, the hood and lights and even some plants! This makes a great aquarium for Angelfish. Angelfish from the Cichlidae family, not to be confused with saltwater angelfish such as the Emperor Angelfish, are native to the Amazon Basin and other tropical South American rivers. They spend much of their time hidden in densely planted areas, with slow water currents. Fully grown Angelfish can grow up to 8 inches tall, so a tall tank is crucial when keeping them. 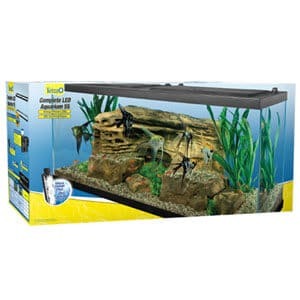 A 50 gallon tank that is a minimum of 15” deep would be suitable for a pair of Angelfish. Remember the bigger the tank, the less likely you are to have behavioral problems such as aggression and territorial marking. As mentioned above, in their native habitat, they enjoy hiding amongst plants and driftwood, so you should ensure your aquarium has this. 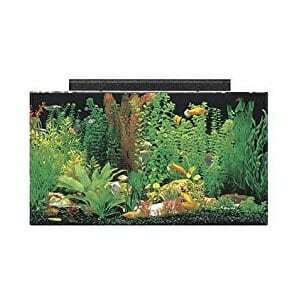 For plants you can use java moss and amazon sword plants to provide Angelfish with sheltered areas. If you’re planning on having more than one Angelfish in a tank, you can use plants to divide up territory. Angelfish should be kept in water that is between 75° and 82°F; ideally 80 °F. They need a pH level between 6.8 and 7.0. Remember they prefer slightly acidic, soft water. Hard alkaline water should be avoided. Also water changes biweekly of 30% are key to keeping good water quality. Fast water flows can cause stress for Angelfish. Always remember to keep the water flow slow; this reduces stress and creates a perfect environment for them. You can use filters specifically designed for Angelfish to produce gentle currents. Like the Oscar and Angelfish, the Discus is native to the Amazon River basin. They are one of the most popular freshwater fish due to their striking shape and vibrant colors. They should not be kept by beginners and ideally you should have several years of fishkeeping experience before you attempt to keep Discus (more on this later). As a rule of thumb for each Discus in the tank, you should add 30 gallons. But as always, the bigger the tank the better, so if possible always try to use 40 gallons per Discus. As they are native to the Amazon River, you should set up your aquarium to replicate this as much as possible. So think nice slow currents, lots of vegetation, plants and driftwood. As they are a tropical fish, you should keep the temperature between 82° and 84°F, with a pH between 6.0 to 7.0 and a 1-4°dKH. The water should be soft and you can ensure this by using a reverse osmosis filter. The exact setup of your water conditions though will depend on where you source your Discus from. Wild Discus require softer, somewhat acidic water. Whereas Asian captive bred discuss will require firmer water. Always check with your dealer first. 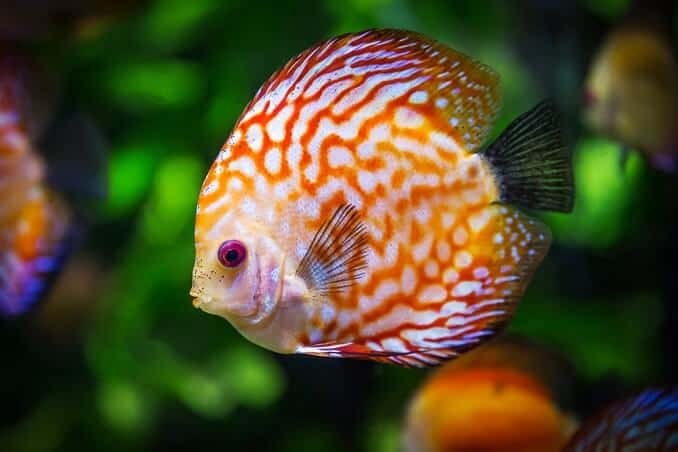 All Discus are extremely sensitive to shifts in ammonia and nitrite levels. They won’t last long if you have excessive levels. You should utilize regular water changes to keep the water clean, and parameters as stable as possible. This aquarium comes complete with lights and would be ideal for a pair of convict cichlids. Similar to many other varieties of Cichlids, the Convict Cichlid is native to the streams of Central America. In particular the species thrives on the western coast of Honduras. Convicts are considered one of the easier varieties of Cichlids to keep due to their size; males grow to around 2.5 inches and females around 2 inches. For this reason the tank you place them in should be at least 30 gallons for a pair of Convicts. However if you’re looking to breed, then you should give them a minimum of 50 gallons. As always, we recommend the setup of your tank should resemble their natural habitat as closely as possible. You should decorate the tank with rocks, sunken branches, caves and plenty of hiding spaces. You can also include plants, but again like Oscars, don’t expect them to stay put for long! For substrate you should have a rocky bottom, and remember they prefer slow moving water. To keep Convict Cichlids healthy you should maintain a water temperature of 79° to 84°F. As Convicts are very hardy you don’t need to worry about pH levels too much, but an ideal range is around 6.6-7.8. Although they are very hardy fish that thrive in a wide variety of water conditions, remember the above figures and stick within those tolerances. Convicts can be aggressive at the best of times; however as a rule they are even more aggressive at higher temperatures. Bear this in mind when setting up your aquarium, and if possible make sure to set it on the slightly cooler side. I hope this article has helped you understand what makes the perfect cichlid tank. As always we recommend trying to make your aquarium as closely matched to the fishes’ natural habitat as possible. Whilst this isn’t possible with all species of fish, with cichlids its fairly straight forward. You must provide your Cichlids plenty of space, slow water currents and plenty of territorial breaks. We’ve outlined the most popular Cichlid tank requirements and general guidance. If the species of Cichlid wasn’t listed here be sure to research in more depth to find their exact tank requirements. Very informative article! Would like to ask about the requirements on cichlid salt. Is it required in a cichlid tank? We had a cichlid tank a few years ago and changed to a more community fish. Never once did we have cichlid salt or had even heard of it. We are in the process of going back to the cichlids and have been told we have to have the salt?? I don’t understand it! Is this something new? Is it required for these types of fish?